Within 10 meters (32ft) of a junction. This notice is intended as a warning. Continued parking in this location may result in prosecution for the offence of Unnecessary Obstruction, contrary to Regulation` 103 of the Road Vehicles (Construction and Use) Regulations 1986, Section 42 of the Road Traffic Act 1988 and Schedule 2 of the Road Traffic Offenders Act 1988. 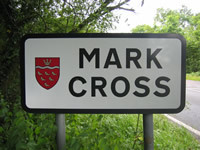 Mark Cross is a small village sitting on the junction of the A267, Tunbridge Wells to the north and Mayfield and Heathfield to the South, and the B2100, Wadhurst to the east and Crowborough to the west. The aim of this site is to be a portal of information for locals seeking facts and information about local goings on, and inform the prospective visitor what the area has to offer. We are proud to announce that the village website has won it's first award. Click here for details. © 2010 & written by Webnix, All Rights Reserved.